The Six-Day War (Hebrew: מלחמת ששת הימים, Milhemet Sheshet Ha Yamim; Arabic: النكسة, an-Naksah, “The Setback” or حرب ۱۹٦۷, Ḥarb 1967, “War of 1967”), also known as the June War, 1967 Arab–Israeli War, or Third Arab–Israeli War, was fought between June 5 and 10, 1967 by Israel and the neighboring states of Egypt (known at the time as the United Arab Republic), Jordan, and Syria. Relations between Israel and its neighbours had never fully normalised following the 1948 Arab–Israeli War. In the period leading up to June 1967, tensions became dangerously heightened. Israel reiterated its 1950s statement that the closure of the straits of Tiran to its shipping would be a casus belli and in late May Nasser announced the straits would be closed to Israeli vessels. Egypt then mobilised its forces along its border with Israel, and on 5 June Israel launched what it claimed were a series of preemptive airstrikes against Egyptian airfields. Claims and counterclaims relating to this series of events are one of a number of controversies relating to the conflict. The Egyptians were caught by surprise, and nearly the entire Egyptian air force was destroyed with few Israeli losses, giving the Israelis air superiority. Simultaneously, the Israelis launched a ground offensive into the Gaza Strip and the Sinai, which again caught the Egyptians by surprise. After some initial resistance, Egyptian leader Gamal Abdel Nasser ordered the evacuation of the Sinai. Israeli forces rushed westward in pursuit of the Egyptians, inflicted heavy losses, and conquered the Sinai. Nasser induced Syria and Jordan to begin attacks on Israel by using the initially confused situation to claim that Egypt had defeated the Israeli air strike. Israeli counterattacks resulted in the seizure of East Jerusalem as well as the West Bank from the Jordanians, while Israel’s retaliation against Syria resulted in its occupation of the Golan Heights. On June 11, a ceasefire was signed. Arab casualties were far heavier than those of Israel: fewer than a thousand Israelis had been killed compared to over 20,000 from the Arab forces. Israel’s military success was attributed to the element of surprise, an innovative and well-executed battle plan, and the poor quality and leadership of the Arab forces. Israel seized control of the Gaza Strip and the Sinai Peninsula from Egypt, the West Bank and East Jerusalem from Jordan, and the Golan Heights from Syria. Israeli morale and international prestige was greatly increased by the outcome of the war and the area under Israeli control tripled. However, the speed and ease of Israel’s victory would lead to a dangerous overconfidence within the ranks of the Israel Defense Forces (IDF), contributing to initial Arab successes in the subsequent 1973 Yom Kippur War. The displacement of civilian populations resulting from the war would have long-term consequences, as 300,000 Palestinians fled the West Bank and about 100,000 Syrians left the Golan to become refugees. Across the Arab world, Jewish minority communities were expelled, with refugees going to Israel or Europe. After the 1956 Suez Crisis, Egypt agreed to the stationing of a United Nations Emergency Force (UNEF) in the Sinai to ensure all parties would comply with the 1949 Armistice Agreements. In the following years there were numerous minor border clashes between Israel and its Arab neighbors, particularly Syria. In early November 1966, Syria signed a mutual defense agreement with Egypt. Soon thereafter, in response to Palestine Liberation Organisation (PLO) guerilla activity, including a mine attack that left three dead, the Israeli Defence Force (IDF) attacked the village of as-Samu in the Jordanian-occupied West Bank. Jordanian units that engaged the Israelis were quickly beaten back. King Hussein of Jordan criticized Egyptian President Gamal Abdel Nasser for failing to come to Jordan’s aid, and “hiding behind UNEF skirts”. In May 1967, Nasser received false reports from the Soviet Union that Israel was massing on the Syrian border. Nasser began massing his troops in two defensive lines in the Sinai Peninsula on Israel’s border (May 16), expelled the UNEF force from Gaza and Sinai (May 19) and took up UNEF positions at Sharm el-Sheikh, overlooking the Straits of Tiran. On May 30, Jordan and Egypt signed a defense pact. The following day, at Jordan’s invitation, the Iraqi army began deploying troops and armoured units in Jordan. They were later reinforced by an Egyptian contingent. On June 1, Israel formed a National Unity Government by widening its cabinet, and on June 4 the decision was made to go to war. The next morning, Israel launched Operation Focus, a large-scale surprise air strike that was the opening of the Six-Day War. Before the war, Israeli pilots and ground crews had trained extensively in rapid refitting of aircraft returning from sorties, enabling a single aircraft to sortie up to four times a day (as opposed to the norm in Arab air forces of one or two sorties per day). This enabled the Israeli Air Force (IAF) to send several attack waves against Egyptian airfields on the first day of the war, overwhelming the Egyptian Air Force, and allowed it to knock out other Arab air forces on the same day. This has contributed to the Arab belief that the IAF was helped by foreign air forces (see Controversies relating to the Six-Day War). Pilots were extensively schooled about their targets, and were forced to memorize every single detail, and rehearsed the operation multiple times on dummy runways in total secrecy. Against Jordan’s forces on the West Bank, Israel deployed about 40,000 troops and 200 tanks (eight brigades). Israeli Central Command forces consisted of five brigades. The first two were permanently stationed near Jerusalem and were called the Jerusalem Brigade and the mechanized Harel Brigade. Mordechai Gur‘s 55th Paratroopers Brigade was summoned from the Sinai front. The 10th Armored Brigade was stationed north of the West Bank. The Israeli Northern Command provided a division (three brigades) led by Major-General Elad Peled, which was stationed in the Jezreel Valley to the north of the West Bank. On the eve of the war, Egypt massed approximately 100,000 of its 160,000 troops in the Sinai, including all of its seven divisions (four infantry, two armoured and one mechanized), four independent infantry brigades and four independent armoured brigades. No fewer than a third of them were veterans of Egypt’s continuing intervention into the North Yemen Civil War and another third were reservists. These forces had 950 tanks, 1,100 APCs, and more than 1,000 artillery pieces. Syria’s army had a total strength of 75,000 and was deployed along the Syrian border. The Jordanian Armed Forces included 11 brigades, totalling 55,000 troops and equipped with some 300 modern Western tanks, 250 of which were U.S. M48 Pattons. Nine brigades (45,000 troops, 270 tanks, 200 artillery pieces) were deployed in the West Bank, including the elite armoured 40th, and two in the Jordan Valley. They possessed sizable numbers of M113 APCs, a new battalion of mechanized infantry, and a paratrooper battalion trained in the new U.S.-built school. They also had 12 battalions of artillery and six batteries of 81 mm and 120 mm mortars. The Jordanian Army, then known as the Arab Legion, was a long-term-service, professional army, relatively well-equipped and well-trained. Furthermore, Israeli post-war briefings said that the Jordanian staff acted professionally as well, but was always left “half a step” behind by the Israeli moves. The small Royal Jordanian Air Force consisted of only 24 British-made Hawker Hunter fighters, six transports, and two helicopters. According to the Israelis, the Hawker Hunter was essentially on par with the French-built Dassault Mirage III – the IAF’s best plane. 100 Iraqi tanks and an infantry division were readied near the Jordanian border. Two squadrons of fighter-aircraft, Hawker Hunters and MiG 21s, were rebased adjacent to the Jordanian border. The Arab air forces were aided by volunteer pilots from the Pakistan Air Force acting in an independent capacity, and by some aircraft from Libya, Algeria, Morocco, Kuwait, and Saudi Arabia to make up for the massive losses suffered on the first day of the war. PAF pilots shot down several Israeli planes. With the exception of Jordan, the Arabs relied principally on Soviet weaponry. Jordan’s army was equipped with American weaponry, and its air force was composed of British aircraft. Egypt had by far the largest and the most modern of all the Arab air forces, consisting of about 420 combat aircraft, all of them Soviet-built and with a heavy quota of top-of-the-line MiG-21s. Of particular concern to the Israelis were the 30 Tu-16 “Badger” medium bombers, capable of inflicting heavy damage on Israeli military and civilian centers. Israel’s first and most critical move was a surprise attack on the Egyptian Air Force. Initially, both Egypt and Israel announced that they had been attacked by the other country. On June 5 at 7:45 Israeli time, as civil defense sirens sounded all over Israel, the IAF launched Operation Focus (Moked). All but 12 of its nearly 200 operational jets launched a mass attack against Egypt’s airfields. The Egyptian defensive infrastructure was extremely poor, and no airfields were yet equipped with hardened aircraft shelters capable of protecting Egypt’s warplanes. Most of the Israeli warplanes headed out over the Mediterranean Sea, flying low to avoid radar detection, before turning toward Egypt. Others flew over the Red Sea. Although the powerful Jordanian radar facility at Ajloun detected waves of aircraft approaching Egypt and reported the code word for “war” up the Egyptian command chain, Egyptian command and communications problems prevented the warning from reaching the targeted airfields. The Israelis employed a mixed-attack strategy: bombing and strafing runs against planes parked on the ground, and bombing to disable runways with special tarmac-shredding penetration bombs developed jointly with France, leaving surviving aircraft unable to take off. The runway at the Arish airfield was spared, as the Israelis expected to turn it into a military airport for their transports after the war. Surviving aircraft were taken out by later attack waves. The operation was more successful than expected, catching the Egyptians by surprise and destroying virtually all of the Egyptian Air Force on the ground, with few Israeli losses. Only four unarmed Egyptian training flights were in the air when the strike began. A total of 338 Egyptian aircraft were destroyed and 100 pilots were killed,although the number of aircraft lost by the Egyptians is disputed. Among the Egyptian planes lost were all 30 Tu-16 bombers, 27 out of 40 Il-28 bombers, 12 Su-7 fighter-bombers, over 90 MiG-21s, 20 MiG-19s, 25 MiG-17 fighters, and around 32 assorted transport planes and helicopters. In addition, Egyptian radars and SAM missiles were also attacked and destroyed. The Israelis lost 19 planes, including two destroyed in air-to-air combat and 13 downed by anti-aircraft artillery. One Israeli plane, which was damaged and unable to break radio silence, was shot down by Israeli Hawk missiles after it strayed over the Negev Nuclear Research Center. Another was destroyed by an exploding Egyptian bomber. The attack guaranteed Israeli air superiority for the rest of the war. Attacks on other Arab air forces by Israel took place later in the day as hostilities broke out on other fronts. The large numbers of Arab aircraft claimed destroyed by Israel on that day were at first regarded as “greatly exaggerated” by the Western press. However, the fact that the Egyptian Air Force, along with other Arab air forces attacked by Israel, made practically no appearance for the remaining days of the conflict proved that the numbers were most likely authentic. Throughout the war, Israeli aircraft continued strafing Arab airfield runways to prevent their return to usability. Meanwhile, Egyptian state-run radio had reported an Egyptian victory, falsely claiming that 70 Israeli planes had been downed on the first day of fighting. On June 5, at 7:50 a.m., the northernmost Israeli division, consisting of three brigades and commanded by Major General Israel Tal, one of Israel’s most prominent armour commanders, crossed the border at two points, opposite Nahal Oz and south of Khan Yunis. They advanced swiftly, holding fire to prolong the element of surprise. Tal’s forces assaulted the “Rafah Gap”, a seven-mile stretch containing the shortest of three main routes through the Sinai towards El-Qantarah el-Sharqiyya and the Suez Canal. The Egyptians had four divisions in the area, backed by minefields, pillboxes, underground bunkers, hidden gun emplacements and trenches. The terrain on either side of the route was impassable. The Israeli plan was to hit the Egyptians at selected key points with concentrated armour. Tal’s advance was led by the 7th Armored Brigade under Colonel Shmuel Gonen. The Israeli plan called for the 7th Brigade to outflank Khan Yunis from the north and the 60th Armored Brigade under Colonel Menachem Aviram would advance from the south. The two brigades would link up and surround Khan Yunis, while the paratroopers would take Rafah. Gonen entrusted the breakthrough to a single battalion of his brigade. Initially, the advance was met with light resistance, as Egyptian intelligence had concluded that it was a diversion for the main attack. However, as Gonen’s lead battalion advanced, it suddenly came under intense fire and took heavy losses. A second battalion was brought up, but was also pinned down. Meanwhile, the 60th Brigade became bogged down in the sand, while the paratroopers had trouble navigating through the dunes. The Israelis continued to press their attack, and despite heavy losses, cleared the Egyptian positions and reached the Khan Yunis railway junction in little over four hours. Gonen’s brigade then advanced nine miles to Rafah in twin columns. Rafah itself was circumvented, and the Israelis attacked Sheikh Zuweid, eight miles to the southwest, which was defended by two brigades. Though inferior in numbers and equipment, the Egyptians were deeply entrenched and camouflaged. The Israelis were pinned down by fierce Egyptian resistance, and called in air and artillery support to enable their lead elements to advance. Many Egyptians abandoned their positions after their commander and several of his staff were killed. The Israelis broke through with tank-led assaults. However, Aviram’s forces misjudged the Egyptians’ flank, and were pinned between strongholds before they were extracted after several hours. By nightfall, the Israelis had finished mopping up resistance. Israeli forces had taken significant losses, with Colonel Gonen later telling reporters that “we left many of our dead soldiers in Rafah, and many burnt-out tanks.” The Egyptians suffered some 2,000 casualties and lost 40 tanks. Israeli reconnaissance forces from the “Shaked” unit in Sinai during the war. On June 5, with the road open, Israeli forces continued advancing towards Arish. Already by late afternoon, elements of the 79th Armored Battalion had charged through the seven-mile long Jiradi defile, a narrow pass defended by well-emplaced troops of the Egyptian 112th Infantry Brigade. In fierce fighting, which saw the pass change hands several times, the Israelis charged through the position. The Egyptians suffered heavy casualties and tank losses, while Israeli losses stood at 66 dead, 93 wounded and 28 tanks. Emerging at the western end, Israeli forces advanced to the outskirts of Arish.As it reached the outskirts of Arish, Tal’s division also consolidated its hold on Rafah and Khan Yunis. The following day, June 6, the Israeli forces on the outskirts of Arish were reinforced by the 7th Brigade, which fought its way through the Jiradi pass. After receiving supplies via an airdrop, the Israelis entered the city and captured the airport at 7:50 am. The Israelis entered the city at 8:00 am. Company commander Yossi Peled recounted that “Al-Arish was totally quiet, desolate. Suddenly, the city turned into a madhouse. Shots came at us from every alley, every corner, every window and house.” An IDF record stated that “clearing the city was hard fighting. The Egyptians fired from the rooftops, from balconies and windows. They dropped grenades into our half-tracks and blocked the streets with trucks. Our men threw the grenades back and crushed the trucks with their tanks.” Gonen sent additional units to Arish, and the city was eventually taken. Brigadier-General Avraham Yoffe‘s assignment was to penetrate Sinai south of Tal’s forces and north or Sharon’s. Yoffe’s attack allowed Tal to complete the capture of the Jiradi defile, Khan Yunis. All of them were taken after fierce fighting. Gonen subsequently dispatched a force of tanks, infantry and engineers under Colonel Yisrael Granit to continue down the Mediterranean coast towards the Suez Canal, while a second force led by Gonen himself turned south and captured Bir Lahfan and Jabal Libni. Further south, on June 6, the Israeli 38th Armored Division under Major-General Ariel Sharon assaulted Um-Katef, a heavily fortified area defended by the Egyptian 2nd Infantry Division under Major-General Sa’adi Nagib, and consisting of some 16,000 troops. The Egyptians also had a battalion of tank destroyers and a tank regiment, formed of Soviet World War II armour, which included 90 T-34-85 tanks, 22 SU-100 tank destroyers, and about 16,000 men. The Israelis had about 14,000 men and 150 post-World War II tanks including the AMX-13, Centurions, and M50 Super Shermans (modified M-4 Sherman tanks). Two armoured brigades in the meantime, under Avraham Yoffe, slipped across the border through sandy wastes that Egypt had left undefended because they were considered impassable. Simultaneously, Sharon’s tanks from the west were to engage Egyptian forces on Um-Katef ridge and block any reinforcements. Israeli infantry would clear the three trenches, while heliborne paratroopers would land behind Egyptian lines and silence their artillery. An armoured thrust would be made at al-Qusmaya to unnerve and isolate its garrison. As Sharon’s division advanced into the Sinai, Egyptian forces staged successful delaying actions at Tarat Umm, Umm Tarfa, and Hill 181. An Israeli jet was downed by anti-aircraft fire, and Sharon’s forces came under heavy shelling as they advanced from the north and west. The Israeli advance, which had to cope with extensive minefields, took a large number of casualties. A column of Israeli tanks managed to penetrate the northern flank of Abu Ageila, and by dusk, all units were in position. The Israelis then brought up ninety 105 mm and 155 mm artillery guns for a preparatory barrage, while civilian buses brought reserve infantrymen under Colonel Yekutiel Adam and helicopters arrived to ferry the paratroopers. These movements were unobserved by the Egyptians, who were preoccupied with Israeli probes against their perimeter. As night fell, the Israeli assault troops lit flashlights, each battalion a different color, to prevent friendly fire incidents. At 10:00 pm, Israeli artillery began a barrage on Um-Katef, firing some 6,000 shells in less than twenty minutes, the most concentrated artillery barrage in Israel’s history. Israeli tanks assaulted the northernmost Egyptian defenses and were largely successful, though an entire armoured brigade was stalled by mines, and had only one mine-clearance tank. Israeli infantrymen assaulted the triple line of trenches in the east. To the west, paratroopers commanded by Colonel Danny Matt landed behind Egyptian lines, though half the helicopters got lost and never found the battlefield, while others were unable to land due to mortar fire. Those that successfully landed on target destroyed Egyptian artillery and ammunition dumps and separated gun crews from their batteries, sowing enough confusion to significantly reduce Egyptian artillery fire. Egyptian reinforcements from Jabal Libni advanced towards Um-Katef to counterattack, but failed to reach their objective, being subjected to heavy air attacks and encountering Israeli lodgements on the roads. Egyptian commanders then called in artillery attacks on their own positions. The Israelis accomplished and sometimes exceeded their overall plan, and had largely succeeded by the following day. The Egyptians took heavy casualties, while the Israelis lost 40 dead and 140 wounded. Yoffe’s attack allowed Sharon to complete the capture of the Um-Katef, after fierce fighting. The main thrust at Um-Katef was stalled due to mines and craters. After IDF engineers had cleared a path by 4:00 pm, Israeli and Egyptian tanks engaged in fierce combat, often at ranges as close as ten yards. The battle ended in an Israeli victory, with 40 Egyptian and 19 Israeli tanks destroyed. Meanwhile, Israeli infantry finished clearing out the Egyptian trenches, with Israeli casualties standing at 14 dead and 41 wounded and Egyptian casualties at 300 dead and 100 taken prisoner. Further south, on June 5, the 8th Armored Brigade under Colonel Albert Mandler, initially positioned as a ruse to draw off Egyptian forces from the real invasion routes, attacked the fortified bunkers at Kuntilla, a strategically valuable position whose capture would enable Mandler to block reinforcements from reaching Um-Katef and to join Sharon’s upcoming attack on Nakhl. The defending Egyptian battalion, outnumbered and outgunned, fiercely resisted the attack, hitting a number of Israeli tanks. However, most of the defenders were killed, and only three Egyptian tanks, one of them damaged, survived. By nightfall, Mendler’s forces had taken Kuntilla. With the exceptions of Rafah and Khan Yunis, Israeli forces had initially avoided entering the Gaza Strip. Israeli Defense Minister Moshe Dayan had expressly forbidden entry into the area. After Palestinian positions in Gaza opened fire on the Negev settlements of Nirim and Kissufim, IDF Chief of Staff Yitzhak Rabin overrode Dayan’s instructions and ordered the 11th Mechanized Brigade under Colonel Yehuda Reshef to enter the Strip. The force was immediately met with heavy artillery fire and fierce resistance from Palestinian forces and remnants of the Egyptian forces from Rafah. By sunset, the Israelis had taken the strategically vital Ali Muntar ridge, overlooking Gaza City, but were beaten back from the city itself. Some 70 Israelis were killed, along with Israeli journalist Ben Oyserman and American journalist Paul Schutzer. Twelve members of UNEF were also killed. On the war’s second day, June 6, the Israelis were bolstered by the 35th Paratroopers Brigade under Colonel Rafael Eitan, and took Gaza City along with the entire Strip. The fighting was fierce, and accounted for nearly half of all Israeli casualties on the southern front. However, Gaza rapidly fell to the Israelis. Meanwhile, on June 6, two Israeli reserve brigades under Yoffe, each equipped with 100 tanks, penetrated the Sinai south of Tal’s division and north of Sharon’s, capturing the road junctions of Abu Ageila, Bir Lahfan, and Arish, taking all of them before midnight. Two Egyptian armoured brigades counterattacked, and a fierce battle took place until the following morning. The Egyptians were beaten back by fierce resistance coupled with airstrikes, sustaining heavy tank losses. They fled west towards Jabal Libni. As Egyptian columns retreated, Israeli aircraft and artillery attacked them. Israeli jets used napalm bombs during their sorties. The attacks destroyed hundreds of vehicles and caused heavy casualties. At Jabal Libni, retreating Egyptian soldiers were fired upon by their own artillery. At Bir Gafgafa, the Egyptians fiercely resisted advancing Israeli forces, knocking out three tanks and eight half-tracks, and killing 20 soldiers. Due to the Egyptians’ retreat, the Israeli High Command decided not to pursue the Egyptian units but rather to bypass and destroy them in the mountainous passes of West Sinai. Therefore, in the following two days (June 6 and 7), all three Israeli divisions (Sharon and Tal were reinforced by an armoured brigade each) rushed westwards and reached the passes. Sharon’s division first went southward then westward, via An-Nakhl, to Mitla Pass with air support. It was joined there by parts of Yoffe’s division, while its other units blocked the Gidi Pass. These passes became killing grounds for the Egyptians, who ran right into waiting Israeli positions and suffered heavy losses. According to Egyptian diplomat Mahmoud Riad, 10,000 men were killed in one day alone, and many others died from hunger and thirst. Tal’s units stopped at various points to the length of the Suez Canal. Israel’s blocking action was partially successful. Only the Gidi pass was captured before the Egyptians approached it, but at other places, Egyptian units managed to pass through and cross the canal to safety. Due to the haste of the Egyptian retreat, soldiers often abandoned weapons, military equipment, and hundreds of vehicles. Many Egyptian soldiers were cut off from their units had to walk about 200 kilometers on foot before reaching the Suez Canal with limited supplies of food and water and were exposed to intense heat. Thousands of soldiers died as a result. 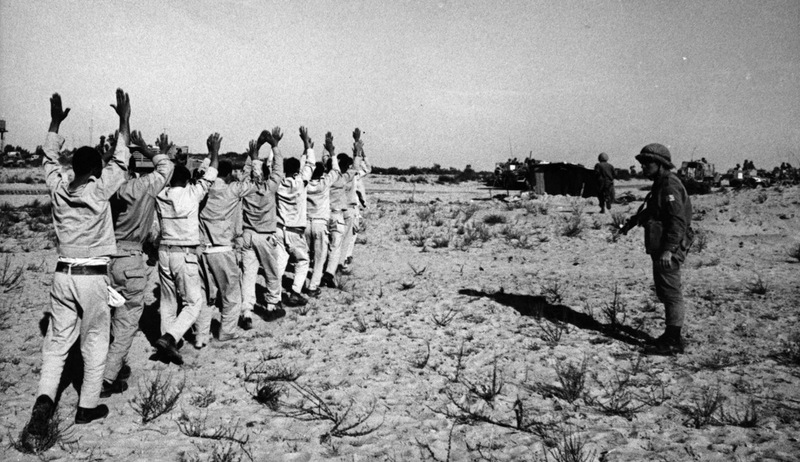 Many Egyptian soldiers chose instead to surrender to the Israelis. However, the Israelis eventually exceeded their capabilities to provide for prisoners. As a result, they began directing soldiers towards the Suez Canal and only taking prisoner high-ranking officers, who were expected to be exchanged for captured Israeli pilots. Several tactical elements made the swift Israeli advance possible: first, the surprise attack that quickly gave the Israeli Air Force complete air superiority over the Egyptian Air Force; second, the determined implementation of an innovative battle plan; third, the lack of coordination among Egyptian troops. These factors would prove to be decisive elements on Israel’s other fronts as well. Jordan was reluctant to enter the war. Nasser used the confusion of the first hours of the conflict to convince King Hussein that he was victorious; he claimed as evidence a radar sighting of a squadron of Israeli aircraft returning from bombing raids in Egypt, which he said was an Egyptian aircraft en route to attack Israel. One of the Jordanian brigades stationed in the West Bank was sent to the Hebron area in order to link with the Egyptians. Hussein decided to attack. The IDF’s strategic plan was to remain on the defensive along the Jordanian front, to enable focus in the expected campaign against Egypt. By 10:30 am, Eshkol had sent a message via Odd Bull to King Hussein promising not to initiate any action against Jordan if it stayed out of the war. King Hussein replied that it was too late, “the die was cast“. At 11:15 am, Jordanian howitzers began a 6,000-shell barrage at Israeli Jerusalem. The Jordanians initially targeted kibbutz Ramat Rachel in the south and Mount Scopus in the north, then ranged into the city center and outlying neighborhoods. Military installations, the Prime Minister’s Residence, and the Knesset compound were also targeted. Israeli civilian casualties totalled 20 dead and about 1,000 wounded. Some 900 buildings were damaged, including Hadassah Ein Kerem Hospital. At 11:50 am, sixteen Jordanian Hawker Hunters attacked Netanya, Kfar Sirkin and Kfar Saba, killing one civilian, wounding seven and destroying a transport plane. Three Iraqi Hawker Hunters strafed civilian settlements in the Jezreel Valley, and an Iraqi Tupolev Tu-16 attacked Afula, and was shot down near the Megiddo airfield. The attack caused minimal material damage, hitting only a senior citizens’ home and several chicken coops, but sixteen Israeli soldiers were killed, most of them when the Tupolev crashed. Shortly before 12:30 pm, the Israeli Air Force attacked Jordan’s two airbases. The Hawker Hunters were refueling at the time of the attack. The Israeli aircraft attacked in two waves, the first of which cratered the runways and knocked out the control towers, and the second wave destroyed all 21 of Jordan’s Hawker Hunter fighters, along with six transport aircraft and two helicopters. One Israeli jet was shot down by ground fire. The immediate Israeli response was an offensive to retake Government House and its ridge. The Jerusalem Brigade’s Reserve Battalion 161, under Lieutenant-Colonel Asher Dreizin, was given the task. Dreizin had two infantry companies and eight tanks under his command, several of which broke down or became stuck in the mud at Ramat Rachel, leaving three for the assault. The Jordanians mounted fierce resistance, knocking out two tanks. The Israelis broke through the compound’s western gate and began clearing the building with grenades, before General Odd Bull, commander of the UN observers, compelled the Israelis to hold their fire, telling them that the Jordanians had already fled. The Israelis proceeded to take the Antenna Hill, directly behind Government House, and clear out a series of bunkers to the west and south. The fighting, often conducted hand-to-hand, continued for nearly four hours before the surviving Jordanians fell back to trenches held by the Hittin Brigade, which were steadily overwhelmed. By 6:30 pm, the Jordanians had retreated to Bethlehem, having suffered about 100 casualties. All but ten of Dreizin’s soldiers were casualties, and Dreizin himself was wounded three times. During the late afternoon of June 5, the Israelis launched an offensive to encircle Jerusalem, which lasted into the following day. During the night, they were supported by intense tank, artillery and mortar fire to soften up Jordanian positions. Searchlights placed atop the Labor Federation building, then the tallest in Israeli Jerusalem, exposed and blinded the Jordanians. The Jerusalem Brigade moved south of Jerusalem, while the mechanized Harel Brigade and 55th Paratroopers Brigade under Mordechai Gur encircled it from the north. A combined force of tanks and paratroopers crossed no-man’s land near the Mandelbaum Gate. One of Gur’s paratroop battalions approached the fortified Police Academy. The Israelis used bangalore torpedoes to blast their way through barbed wire leading up to the position while exposed and under heavy fire. With the aid of two tanks borrowed from the Jerusalem Brigade, they captured the Police Academy. After receiving reinforcements, they moved up to attack Ammunition Hill. The battalion subsequently drove east, and linked up with the Israeli enclave on Mount Scopus and its Hebrew University campus. Gur’s other battalions captured the other Jordanian positions around the American Colony, despite being short on men and equipment and having come under a Jordanian mortar bombardment while waiting for the signal to advance. With Jordanian defenses in Jerusalem crumbling, elements of the Jordanian 60th Brigade and an infantry battalion were sent from Jericho to reinforce Jerusalem. Its original orders were to repel the Israelis from the Latrun corridor, but due to the worsening situation in Jerusalem, the brigade was ordered to proceed to Jerusalem’s Arab suburbs and attack Mount Scopus. Parallel to the brigade were infantrymen from the Imam Ali Brigade, who were approaching Issawiya. The brigades were spotted by Israeli aircraft and decimated by rocket and cannon fire. Other Jordanian attempts to reinforce Jerusalem were beaten back, either by armoured ambushes or airstrikes. Fearing damage to holy sites and the prospect of having to fight in built-up areas, Dayan ordered his troops not to enter the Old City. He also feared that Israel would be subjected to a fierce international backlash and the outrage of Christians worldwide if it forced its way into the Old City. Privately, he told David Ben-Gurion that he was also concerned over the prospect of Israel capturing Jerusalem’s holy sites, only to be forced to give them up under the threat of international sanctions. In the north, one battalion from Peled’s division was sent to check Jordanian defenses in the Jordan Valley. A brigade belonging to Peled’s division captured the western part of the West Bank. One brigade attacked Jordanian artillery positions around Jenin, which were shelling Ramat David Airbase. The Jordanian 12th Armored Battalion, which outnumbered the Israelis, held off repeated attempts to capture Jenin. However, Israeli air attacks took their toll, and the Jordanian M48 Pattons, with their external fuel tanks, proved vulnerable at short distances, even to the Israeli-modified Shermans. Twelve Jordanian tanks were destroyed, and only six remained operational. 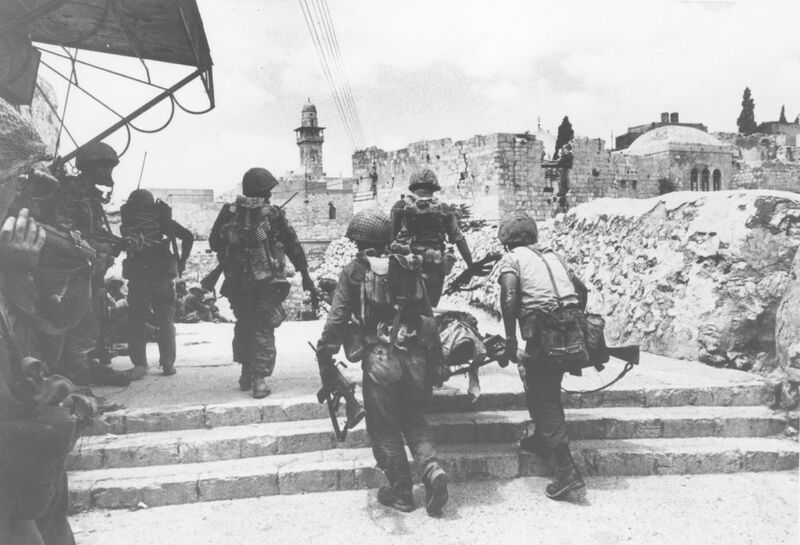 David Rubinger‘s famed photograph of IDF paratroopers at Jerusalem‘s Western Wall shortly after its capture. From left to right: Zion Karasenti, Yitzhak Yifat, and Haim Oshri. Just after dusk, Israeli reinforcements arrived. The Jordanians continued to fiercely resist, and the Israelis were unable to advance without artillery and air support. One Israeli jet attacked the Jordanian commander’s tank, wounding him and killing his radio operator and intelligence officer. The surviving Jordanian forces then withdrew to Jenin, where they were reinforced by the 25th Infantry Brigade. The Jordanians were effectively surrounded in Jenin. After the Old City fell, the Jerusalem Brigade reinforced the paratroopers, and continued to the south, capturing Judea and Gush Etzion. Hebron was taken without any resistance. Fearful that Israeli soldiers would exact retribution for the 1929 massacre of the city’s Jewish community, Hebron’s residents flew white sheets from their windows and rooftops, and voluntarily gave up their weapons. The Harel Brigade proceeded eastward, descending to the Jordan River. On June 7, Israeli forces seized Bethlehem, taking the city after a brief battle that left some 40 Jordanian soldiers dead, with the remainder fleeing. On the same day, one of Peled’s brigades seized Nablus; then it joined one of Central Command’s armoured brigades to fight the Jordanian forces; as the Jordanians held the advantage of superior equipment and were equal in numbers to the Israelis. Again, the air superiority of the IAF proved paramount as it immobilized the Jordanians, leading to their defeat. One of Peled’s brigades joined with its Central Command counterparts coming from Ramallah, and the remaining two blocked the Jordan river crossings together with the Central Command’s 10th. Engineering Corps sappers blew up the Abdullah and Hussein bridges with captured Jordanian mortar shells, while elements of the Harel Brigade crossed the river and occupied positions along the east bank to cover them, but quickly pulled back due to American pressure. The Jordanians, anticipating an Israeli offensive deep into Jordan, assembled the remnants of their army and Iraqi units in Jordan to protect the western approaches to Amman and the southern slopes of the Golan Heights. No specific decision had been made to capture any other territories controlled by Jordan. After the Old City was captured, Dayan told his troops to dig in to hold it. When an armoured brigade commander entered the West Bank on his own initiative, and stated that he could see Jericho, Dayan ordered him back. It was only after intelligence reports indicated that Hussein had withdrawn his forces across the Jordan River that Dayan ordered his troops to capture the West Bank. 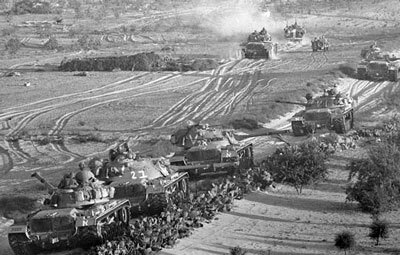 In May–June 1967, the Israeli government did everything in its power to confine the confrontation to the Egyptian front. Eshkol and his colleagues took into account the possibility of some fighting on the Syrian front. False Egyptian reports of a crushing victory against the Israeli army and forecasts that Egyptian forces would soon be attacking Tel Aviv influenced Syria’s decision to enter the war. Syrian artillery began shelling northern Israel, and twelve Syrian jets attacked Israeli settlements in the Galilee. Israeli fighter jets intercepted the Syrian aircraft, shooting down three and driving off the rest. In addition, two Lebanese Hawker Hunter jets, two of the twelve Lebanon had, crossed into Israeli airspace and began strafing Israeli positions in the Galilee. They were intercepted by Israeli fighter jets, and one was shot down. A minor Syrian force tried to capture the water plants at Tel Dan (the subject of a fierce escalation two years earlier), Dan, and She’ar Yashuv. These attacks were repulsed with the loss of twenty soldiers and seven tanks. An Israeli officer was also killed. But a broader Syrian offensive quickly failed. Syrian reserve units were broken up by Israeli air attacks, and several tanks were reported to have sunk in the Jordan River. Our forces did not go on the offensive either because they did not arrive or were not wholly prepared or because they could not find shelter from the enemy’s planes. The reserves could not withstand the air attacks; they dispersed after their morale plummeted. The Syrians abandoned hopes of a ground attack and began a massive bombardment of Israeli communities in the Hula Valley instead. On the evening of June 5, the Israeli Air Force attacked Syrian airfields. The Syrian Air Force lost some 32 MiG 21s, 23 MiG-15 and MiG-17 fighters, and two Ilyushin Il-28 bombers, two-thirds of its fighting strength. The Syrian aircraft that survived the attack retreated to distant bases and played no further role in the war. Following the attack, Syria realised that the news it had received from Egypt of the near-total destruction of the Israeli military could not have been true. On June 7 and 8, the Israeli leadership debated about whether to attack the Golan Heights as well. Syria had supported pre-war raids that had helped raise tensions and had routinely shelled Israel from the Heights, so some Israeli leaders wanted to see Syria punished. Military opinion was that the attack would be extremely costly, since it would entail an uphill battle against a strongly fortified enemy. The western side of the Golan Heights consists of a rock escarpment that rises 500 meters (1,700 ft) from the Sea of Galilee and the Jordan River, and then flattens to a gently sloping plateau. Dayan opposed the operation bitterly at first, believing such an undertaking would result in losses of 30,000 and might trigger Soviet intervention. Prime Minister Eshkol, on the other hand, was more open to the possibility, as was the head of the Northern Command, David Elazar, whose unbridled enthusiasm for and confidence in the operation may have eroded Dayan’s reluctance. Eventually, the situation on the Southern and Central fronts cleared up, intelligence estimated that the likelihood of Soviet intervention had been reduced, reconnaissance showed some Syrian defenses in the Golan region collapsing, and an intercepted cable revealed that Nasser was urging the President of Syria to immediately accept a cease-fire. At 3 am on June 9, Syria announced its acceptance of the cease-fire. Despite this announcement, Dayan became more enthusiastic about the idea and four hours later at 7 am, “gave the order to go into action against Syria” without consultation or government authorisation. The Syrian army consisted of about 75,000 men grouped in nine brigades, supported by an adequate amount of artillery and armour. Israeli forces used in combat consisted of two brigades (the 8th Armored Brigade and the Golani Brigade) in the northern part of the front at Givat HaEm, and another two (infantry and one of Peled’s brigades summoned from Jenin) in the center. The Golan Heights’ unique terrain (mountainous slopes crossed by parallel streams every several kilometers running east to west), and the general lack of roads in the area channeled both forces along east-west axes of movement and restricted the ability of units to support those on either flank. Thus the Syrians could move north-south on the plateau itself, and the Israelis could move north-south at the base of the Golan escarpment. An advantage Israel possessed was the excellent intelligence collected by Mossad operative Eli Cohen (who was captured and executed in Syria in 1965) regarding the Syrian battle positions. Syria had built extensive defensive fortifications in depths up to 15 kilometers, comparable to the Maginot Line. On the morning of June 9, Israeli jets began carrying out dozens of sorties against Syrian positions from Mount Hermon to Tawfiq, using rockets salvaged from captured Egyptian stocks. The airstrikes knocked out artillery batteries and storehouses and forced transport columns off the roads. The Syrians suffered heavy casualties and a drop in morale, with a number of senior officers and troops deserting. The attacks also provided time as Israeli forces cleared paths through Syrian minefields. However, the airstrikes did not seriously damage the Syrians’ bunkers and trench systems, and the bulk of Syrian forces on the Golan remained in their positions. About two hours after the airstrikes began, the 8th Armored Brigade, led by Colonel Albert Mandler, advanced into the Golan Heights from Givat HaEm. Its advance was spearheaded by Engineering Corps sappers and eight bulldozers, which cleared away barbed wire and mines. As they advanced, the force came under fire, and five bulldozers were immediately hit. The Israeli tanks, with their maneuverability sharply reduced by the terrain, advanced slowly under fire toward the fortified village of Sir al-Dib, with their ultimate objective being the fortress at Qala. Israeli casualties steadily mounted. Part of the attacking force lost its way and emerged opposite Za’ura, a redoubt manned by Syrian reservists. With the situation critical, Colonel Mandler ordered simultaneous assaults on Za’ura and Qala. Heavy and confused fighting followed, with Israeli and Syrian tanks struggling around obstacles and firing at extremely short ranges. Mandler recalled that “the Syrians fought well and bloodied us. We beat them only by crushing them under our treads and by blasting them with our cannons at very short range, from 100 to 500 meters.” The first three Israeli tanks to enter Qala were stopped by a Syrian bazooka team, and a relief column of seven Syrian tanks arrived to repel the attackers. The Israelis took heavy fire from the houses, but could not turn back, as other forces were advancing behind them, and they were on a narrow path with mines on either side. The Israelis continued pressing forward, and called for air support. A pair of Israeli jets destroyed two of the Syrian tanks, and the remainder withdrew. The surviving defenders of Qala retreated after their commander was killed. Meanwhile, Za’ura fell in an Israeli assault, and the Israelis also captured the ‘Ein Fit fortress. In the central sector, the Israeli 181st Battalion captured the strongholds of Dardara and Tel Hillal after fierce fighting. Desperate fighting also broke out along the operation’s northern axis, where Golani Brigade attacked thirteen Syrian positions, including the formidable Tel Fakhr position. Navigational errors placed the Israelis directly under the Syrians’ guns. In the fighting that followed, both sides took heavy casualties, with the Israelis losing all nineteen of their tanks and half-tracks. On the northern flank, the Israelis broke through within minutes and cleared out the trenches and bunkers. During the seven-hour battle, the Israelis lost 31 dead and 82 wounded, while the Syrians lost 62 dead and 20 captured. Among the dead was the Israeli battalion commander. The Golani Brigade’s 51st Battalion took Tel ‘Azzaziat, and Darbashiya also fell to Israeli forces. By the evening of June 9, the four Israeli brigades had all broken through to the plateau, where they could be reinforced and replaced. Thousands of reinforcements began reaching the front, those tanks and half-tracks that had survived the previous day’s fighting were refueled and replenished with ammunition, and the wounded were evacuated. By dawn, the Israelis had eight brigades in the sector. Syria’s first line of defense had been shattered, but the defenses beyond that remained largely intact. Mount Hermon and the Banias in the north, and the entire sector between Tawfiq and Customs House Road in the south remained in Syrian hands. In a meeting early on the night of June 9, Syrian leaders decided to reinforce those positions as quickly as possible, and to maintain a steady barrage on Israeli civilian settlements. Meanwhile, the 8th Brigade’s tanks moved south from Qala, advancing six miles to Wasit under heavy artillery and tank bombardment. At the Banias in the north, Syrian mortar batteries opened fire on advancing Israeli forces only after Golani Brigade sappers cleared a path through a minefield, killing sixteen Israeli soldiers and wounding four. On the next day, June 10, the central and northern groups joined in a pincer movement on the plateau, but that fell mainly on empty territory as the Syrian forces retreated. At 8:30 am, the Syrians began blowing up their own bunkers, burning documents and retreating. Several units joined by Elad Peled’s troops climbed to the Golan from the south, only to find the positions mostly empty. When the 8th Brigade reached Mansura, five miles from Wasit, the Israelis met no opposition and found abandoned equipment, including tanks, in perfect working condition. In the fortified Banias village, Golani Brigade troops found only several Syrian soldiers chained to their positions. During the day, the Israeli units stopped after obtaining manoeuvre room between their positions and a line of volcanic hills to the west. In some locations, Israeli troops advanced after an agreed-upon cease-fire to occupy strategically strong positions. To the east, the ground terrain is an open gently sloping plain. This position later became the cease-fire line known as the “Purple Line“. By June 10, Israel had completed its final offensive in the Golan Heights, and a ceasefire was signed the day after. Israel had seized the Gaza Strip, the Sinai Peninsula, the West Bank of the Jordan River (including East Jerusalem), and the Golan Heights. About one million Arabs were placed under Israel’s direct control in the newly captured territories. Israel’s strategic depth grew to at least 300 kilometers in the south, 60 kilometers in the east, and 20 kilometers of extremely rugged terrain in the north, a security asset that would prove useful in the Yom Kippur War six years later. Our airmen, who struck the enemies’ planes so accurately that no one in the world understands how it was done and people seek technological explanations or secret weapons; our armoured troops who beat the enemy even when their equipment was inferior to his; our soldiers in all other branches … who overcame our enemies everywhere, despite the latter’s superior numbers and fortifications—all these revealed not only coolness and courage in the battle but … an understanding that only their personal stand against the greatest dangers would achieve victory for their country and for their families, and that if victory was not theirs the alternative was annihilation. In recognition of contributions, Rabin was given the honour of naming the war for the Israelis. From the suggestions proposed, including the “War of Daring”, “War of Salvation”, and “War of the Sons of Light”, he “chose the least ostentatious, the Six-Day War, evoking the days of creation”. Dayan’s final report on the war to the Israeli general staff listed several shortcomings in Israel’s actions, including misinterpretation of Nasser’s intentions, overdependence on the United States, and reluctance to act when Egypt closed the Straits. He also credited several factors for Israel’s success: Egypt did not appreciate the advantage of striking first and their adversaries did not accurately gauge Israel’s strength and its willingness to use it. In Egypt, according to Heikal, Nasser had admitted his responsibility for the military defeat in June 1967.According to historian Abd al-Azim Ramadan, Nasser’s mistaken decisions to expel the international peacekeeping force from the Sinai Peninsula and close the Straits of Tiran in 1967 led to a state of war with Israel, despite Egypt’s lack of military preparedness. After the 1973 Yom Kippur War, Egypt reviewed the causes of its loss of the 1967 war. Issues that were identified included “the individualistic bureaucratic leadership”; “promotions on the basis of loyalty, not expertise, and the army’s fear of telling Nasser the truth”; lack of intelligence; and better Israeli weapons, command, organization, and will to fight. Between 776 and 983 Israelis were killed and 4,517 were wounded. 15 Israeli soldiers were captured. Arab casualties were far greater. Between 9,800 and 15,000 Egyptian soldiers were listed as killed or missing in action. An additional 4,338 Egyptian soldiers were captured. Jordanian losses are estimated to be 6,000 killed or missing and 533 captured, though Gawrych cites a number of some 700 killed in action with another 2,500 wounded.The Syrians were estimated to have sustained between 1,000 and 2,500 killed in action. Between 367 and 591 Syrians were captured. At the commencement of hostilities, both Egypt and Israel announced that they had been attacked by the other country. The Israeli government later abandoned its initial position, acknowledging Israel had struck first, claiming that it was a preemptive strike in the face of a planned invasion by Egypt. On the other hand, the Arab view was that it was unjustified to attack Egypt. Many commentators consider the war as the classic case of anticipatory attack in self-defense. America features prominently in Arab conspiracy theories purporting to explain the June 1967 defeat. Mohamed Hassanein Heikal, a confidant of Nasser, claims that President Lyndon B. Johnson was obsessed with Nasser and that Johnson conspired with Israel to bring him down. The reported Israeli troop movements seemed all the more threatening because they were perceived in the context of a US conspiracy against Egypt. Salah Bassiouny of the Foreign ministry, claims that Foreign Ministry saw the reported Israeli troop movements as credible because Israel had reached the level at which it could find strategic alliance with the United States. During the war, Cairo announced that American and British planes were participating in the Israeli attack. Nasser broke off diplomatic relations following this allegation. Nasser’s image of the United States was such that he might well have believed the worst. However Anwar Sadat implied that Nasser used this deliberate conspiracy in order to accuse the United States as a political cover-up for domestic consumption. Lutfi Abd al-Qadir, the director of Radio Cairo during the late 1960s, who accompanied Nasser to his visits in Moscow, had his conspiracy theory that both the Soviets and the Western powers wanted to topple Nasser or to reduce his influence. On June 8, 1967, USS Liberty, a United States Navy electronic intelligence vessel sailing 13 nautical miles (24 km) off Arish (just outside Egypt’s territorial waters), was attacked by Israeli jets and torpedo boats, nearly sinking the ship, killing 34 sailors and wounding 171. Israel said the attack was a case of mistaken identity, and that the ship had been misidentified as the Egyptian vessel El Quseir. Israel apologized for the mistake, and paid compensation to the victims or their families, and to the United States for damage to the ship. After an investigation, the U.S. accepted the explanation that the incident was friendly fire and the issue was closed by the exchange of diplomatic notes in 1987. Others however, including the then United States Secretary of State Dean Rusk, Chief of Naval Operations at the time, Admiral Thomas Moorer, some survivors of the attack and intelligence officials familiar with transcripts of intercepted signals on the day, have rejected these conclusions as unsatisfactory and maintain that the attack was made in the knowledge that the ship was American. The aftermath of the war is also of religious significance. Under Jordanian rule, Jews were expelled from Jerusalem and were effectively barred from visiting the Western Wall (even though Article VIII of the 1949 Armistice Agreement demanded Israeli Jewish access to the Western Wall). Jewish holy sites were not maintained, and Jewish cemeteries had been desecrated. After the annexation to Israel, each religious group was granted administration over its holy sites. For the first time since 1948, Jews could visit the Old City of Jerusalem and pray at the Western Wall, the holiest site where Jews are permitted to pray. Despite the Temple Mount being the most important holy site in Jewish tradition, the al-Aqsa Mosque has been under sole administration of the Jordanian Muslim Waqf, and Jews are barred from praying on the Temple Mount, although they are allowed to visit it. In Hebron, Jews gained access to the Cave of the Patriarchs (the second most holy site in Judaism, after the Temple Mount) for the first time since the 14th century (previously Jews were allowed to pray only at the entrance). Other Jewish holy sites, such as Rachel’s Tomb in Bethlehem and Joseph’s Tomb in Nablus, also became accessible. .Most notably, the war stirred Zionist passions among Jews in the Soviet Union, who had by that time been forcibly assimilated. Many Soviet Jews subsequently applied for exit visas and began protesting for their right to immigrate to Israel. Following diplomatic pressure from the West, the Soviet government began granting exit visas to Jews in growing numbers. From 1970 to 1988, some 291,000 Soviet Jews were granted exit visas, of whom 165,000 immigrated to Israel and 126,000 immigrated to the United States. The June 19 Israeli cabinet decision did not include the Gaza Strip, and left open the possibility of Israel permanently acquiring parts of the West Bank. On June 25–27, Israel incorporated East Jerusalem together with areas of the West Bank to the north and south into Jerusalem’s new municipal boundaries. In September, the Khartoum Arab Summit resolved that there would be “no peace, no recognition and no negotiation with Israel”. However, as Avraham Sela notes, the Khartoum conference effectively marked a shift in the perception of the conflict by the Arab states away from one centered on the question of Israel’s legitimacy, toward one focusing on territories and boundaries. This was shown on November 22 when Egypt and Jordan accepted United Nations Security Council Resolution 242. Nasser forestalled any movement toward direct negotiations with Israel. In dozens of speeches and statements, Nasser posited the equation that any direct peace talks with Israel were tantamount to surrender. 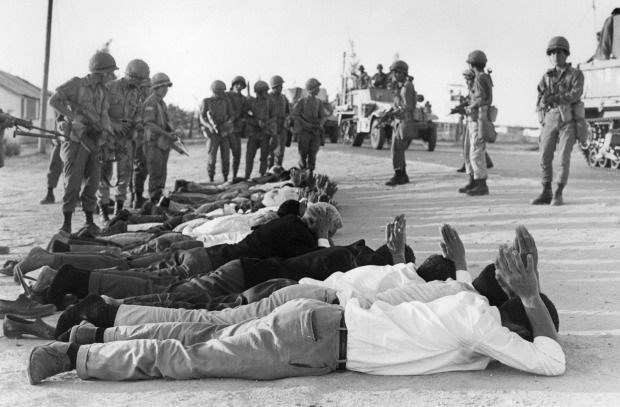 The 1967 War laid the foundation for future discord in the region, as the Arab states resented Israel’s victory and did not want to give up territory. On November 22, 1967, the United Nations Security Council adopted Resolution 242, the “land for peace” formula, which called for Israeli withdrawal “from territories occupied” in 1967 and “the termination of all claims or states of belligerency”. Resolution 242 recognized the right of “every state in the area to live in peace within secure and recognized boundaries free from threats or acts of force.” Israel returned the Sinai to Egypt in 1978, after the Camp David Accords, and disengaged from the Gaza Strip in the summer of 2005. Its army frequently re-enters Gaza for military operations and still retains control of the seaports, airports and most of the border crossings. 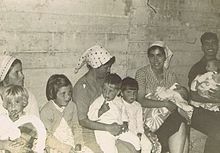 There was extensive displacement of populations in the captured territories: of about one million Palestinians in the West Bank and Gaza, 300,000 (according to the United States Department of State) either fled, or were displaced from their homes, to Jordan, where they contributed to the growing unrest. The other 700,000 remained. In the Golan Heights, an estimated 80,000 Syrians fled. Israel allowed only the inhabitants of East Jerusalem and the Golan Heights to receive full Israeli citizenship, applying its law, administration and jurisdiction to these territories in 1967 and 1981, respectively. The vast majority of the populations in both territories declined to take citizenship. See also Israeli–Palestinian conflict and Golan Heights. In three villages southwest of Jerusalem and at Qalqilya, houses were destroyed “not in battle, but as punishment … and in order to chase away the inhabitants … contrary to government … policy,” Dayan wrote in his memoirs. In Qalqilya, about a third of the homes were razed and about 12,000 inhabitants were evicted, though many then camped out in the environs. The evictees in both areas were allowed to stay and later were given cement and tools by the Israeli authorities to rebuild at least some of their dwellings. But many thousands of other Palestinians now took to the roads. Perhaps as many as seventy thousand, mostly from the Jericho area, fled during the fighting; tens of thousands more left over the following months. Altogether, about one-quarter of the population of the West Bank, about 200–250,000 people, went into exile. … They simply walked to the Jordan River crossings and made their way on foot to the East Bank. It is unclear how many were intimidated or forced out by the Israeli troops and how many left voluntarily, in panic and fear. There is some evidence of IDF soldiers going around with loudspeakers ordering West Bankers to leave their homes and cross the Jordan. Some left because they had relatives or sources of livelihood on the East Bank and feared being permanently cut off. Jordan and Egypt eventually withdrew their claims to sovereignty over the West Bank and Gaza, respectively. (The Sinai was returned to Egypt on the basis of the Camp David Accords of 1978.) Israel and Jordan signed a peace treaty in 1994. After the Israeli conquest of these newly acquired ‘territories’, it launched a large settlement effort in these areas to secure a permanent foothold. There are now hundreds of thousands of Israeli settlers in the West Bank. They are a matter of controversy within Israel, both among the general population and within different political administrations, supporting them to varying degrees. Palestinians consider them a provocation. The Israeli settlements in Gaza were evacuated and destroyed in August 2005 as a part of Israel’s unilateral disengagement plan of that time.